Members of Stand Up to Racism and the Socialist Workers' Party were involved in a stand-off with activist James Goddard and 'yellow vest' members in Piccadilly Gardens yesterday. The Yellow Vest activists said they were in the city to commemorate the one year anniversary of a hit and run incident in West London which claimed the lives of three teenage boys who were knocked down on their way to play five-a-side football. Activists believe the driver’s intention was to deliberately kill the three boys and have led a campaign pushing for the driver to be charged with three counts of murder. Police officers stood between both opposing groups in Piccadilly after an initial heated argument broke out. Activists could be heard chanting support for Tommy Robinson. 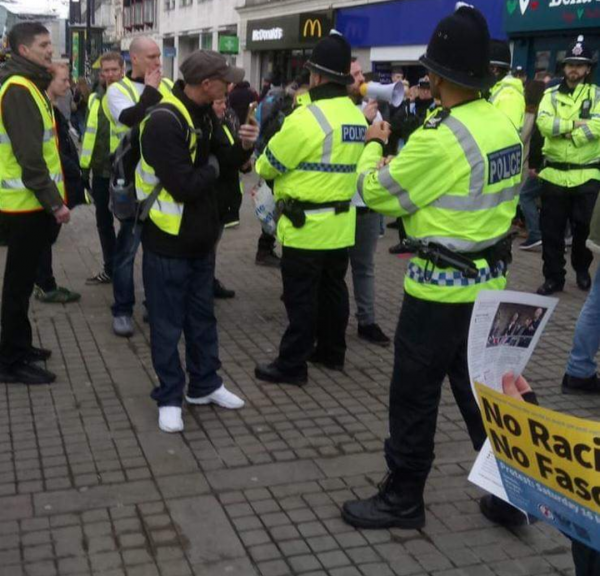 Members of Stand Up to Racism complained to the police after a stall was allegedly knocked over. Goddard was arrested in London soon after a demonstration outside Parliament where activists interrupted Anna Soubry during an interview with the BBC and began chanting ‘Soubry is a Nazi’. He was charged with a public order offence and in accordance with his bail conditions is forbidden from entering Broxtowe in Nottinghamshire; which Anna Soubry has been MP for since 2010. The police kept both sides apart in Piccadilly Gardens and no incidents of violence occurred. Officers on horseback oversaw the demonstrations. When asked about their presence by NQ, an officer said: "Some people just can't be trusted to behave themselves." James Goddard spoke with NQ about the incident in London. He said: “We’ve used the tactic of the left, who have been going out calling us ‘Nazis and racists'. We have made numerous attempts to engage in dialogue but they just don’t want to know. "I have no problem with Europe, we can trade with Europe but I don't see why we should be dictated to by the European Union." A speaker from Stand Up to Racism addressed the demonstration, telling the crowd: “Unite against the Tory government. Unite against austerity. Unite against racism and fascism. “Join the fight universal credit. Join the fight for social housing for all. Join the fight to get rid of this rotten Tory government before they do any more damage to ordinary working people”. Following the interview with Goddard, an NQ reporter was confronted by a member of the Socialist Workers party and accused of being in league with fascism before being forcibly ejected from the demonstration. Other activist members declined the offer to be interviewed. The matter was later resolved. One activist from Stand Up to Racism later stated: “We don’t want to be filmed, or it’ll be a brick through the windows of our houses”. Jim Edwards from the Pro-Brexiteers group told NQ: "It's mainly a Brexit demonstration, there is an element of the Justice for our Boys campaign as well. "Ultimately there is a general left and right divide here. We have come to talk to the Socialists Workers and Stand Up to Racism but there hasn't been any dialogue, unfortunately". Manchester Stand Up to Racism has called for a solidarity event to be held one week from today following the demonstration. FREE city centre parking on offer this weekend!